I have a network currently set up as per the image below. We use Regus's shared Internet and I've create a sub network for our office by using DHCP and NAT on the airport extreme router. 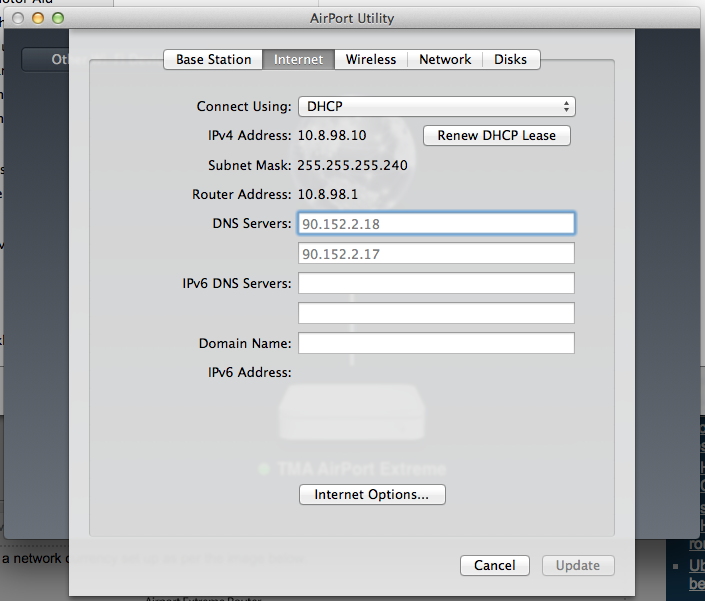 Now the Airport Extreme complains there is Double NAT - but it still appears to work fine. I manually set the DNS servers on each client's network adapter and everything works. What I am trying to do is set it up so the DHCP from the router auto assigns the DNS servers to the client machines without me having to manually enter them for each client. The problem is when I set the DNS servers on the router to 192.168.1.2 and 192.168.1.1 - this doesn't work and web pages don't load. I am a bit stuck here and manually entering the DNS servers will prove to be a longer process. How can I get the DNS servers to auto assign? I've been advised that it's better to use the Windows server as a DHCP server, but unfortunately if I want to use the router with NAT, DHCP is forced. Is it better for me to have the Windows Server as the router with NAT and have the Airport as just a bridge? 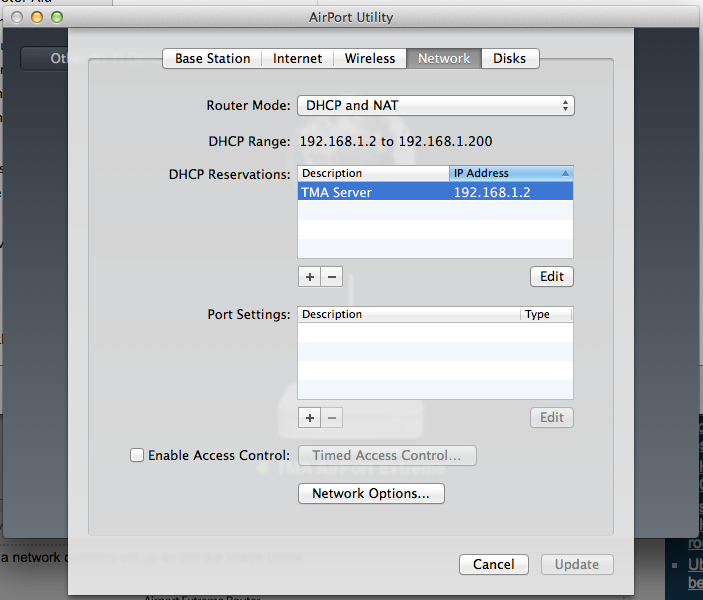 Using an Airport Extreme as dhcp server is not a good idea when anyone haves a complex LAN/Scenario, because in the dhcp server you can only set 2 ipv4 dns server address, so in your case use the primary for the internal resolution (win server) and use the secondary for a public dns server (ISP/other) don't forget to set your internal domain name (if you have one) in the "Domain Name" filed. In other hand you can configure your windows server to resolve internal and external query names to do this, first configure your local domain and internal dns records in your windows server (don't forget the reverse records for each host), and finally in your windows server configure the forwarders in DNS-> your zone click on Action menu, click Properties and the Forwarders tab, click edit and finally type the ip address of your ISP DNS servers, in your Airport Extreme router only configure 1 dns server this one must be the ip address of your windows server. It appears that your DNS/DHCP needs are a bit more comprehensive than I would personally be cozy with handling with a simple consumer router. Not the answer you're looking for? Browse other questions tagged networking windows-server-2012 dhcp nat or ask your own question. Can I access a NAT addressed host behind a gateway from the WAN side without DNS or VPN (with DNS if it's not possible)?